Will The Mazda2 Come To The US Bearing Diesels? As of late, it has looked as though the Mazda2 will not be making a visit to America, due mostly to the presence of the Ford Fiesta in the US market. We'd gotten close to accepting this and just moving on when Mazda once again piqued our interest. Jim O'Sullivan, head of Mazda North America, mentioned at a lunch with reporters that Mazda was maybe considering bringing diesel Mazda2's over here. Sort of. "We're not ready to make the announcement but obviously we sell diesels in Europe. 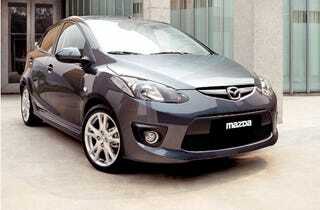 The Mazda2 is extremely successful in Europe and Asia. We're continuing to watch that space in America."